If the voter wishes to cross off the name of the candidate it must be done with a red pen next to the ballot box with no secrecy. While candidates could be nominated by anyone, it was the practice for all candidates to be nominated by the parties. These nominations were examined by the United Reunification Front and then by the Central Electoral Committee, which allocated candidates to seats. The candidate in each seat was then considered by the electors in meetings at the workplace or similar, and on election day the electors could then indicate approval or disapproval of the candidate on the ballot paper. Only one candidate appears on each ballot. Elections are ostensibly conducted by secret ballot, and a voter may cross off the candidate's name to vote against him/her, but must do so by crossing out the name without secrecy. Voting is mandatory and turnout is habitually near 100%. Members of the Supreme People's Assembly are elected to five-year terms, and meet for SPA sessions up to ten days per year. The Supreme People's Assembly elects a standing committee known as the Presidium, which exercises legislative functions when the Assembly is not in session. It also elects the Chairman of the National Defence Commission, the country's chief executive, and the Premier. Local elections have been held since 1999. The people elect representatives to city, county, and provincial people's assemblies in local elections every four years. The number of representatives is determined by the population of each jurisdiction. Mayors and governors are elected. Their role is to work with the unelected and more influential city and province party secretaries. The elections have been variously described as show elections or a political census. Seats are uncompetitive as all candidates are chosen by the Democratic Front for the Reunification of the Fatherland. Because of the near-100% turnout, elections double as unofficial censuses. The inminban neighborhood watch reportedly watches the elections to identify and investigate no-shows. A voter may cross off the candidate's name to vote against him or her, but in most polling stations the voter must do so with a red pen next to the ballot box in sight of electoral officials. In recent elections, there have been separate boxes for "no" votes. Many North Korean defectors claim such an act of defiance is too risky to attempt. Indeed, voting against the official candidate is considered an act of treason, and those who do face the loss of their jobs and housing, along with extra surveillance. 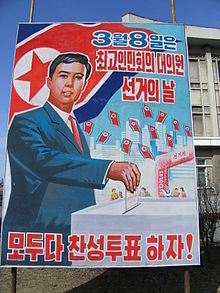 The latest election was the first conducted under the leadership of Kim Jong-un following the death of Kim Jong-il in December 2011. 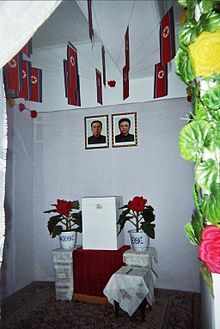 The last election conducted under the leadership of Kim Jong-il was held on March 8, 2009. The following day, North Korean media announced that he was unanimously re-elected to parliament, though none of his sons were among the appointments. The election committee also stated that 99.98% of all registered voters took part in voting, with 100% voting for their candidate in each district. All seats were won by the Democratic Front for the Reunification of the Fatherland, under the control of the Worker's Party. ^ a b c "DPRK Holds Election of Local and National Assemblies". People's Korea. Archived from the original on 2013-03-31. Retrieved 2008-06-28. ^ "The Parliamentary System of the Democratic People's Republic of Korea" (PDF). Constitutional and Parliamentary Information. Association of Secretaries General of Parliaments (ASGP) of the Inter-Parliamentary Union. p. 4. Retrieved 2010-10-01. ^ a b c Moon, Angela; Sugita Katyal; Ralph Boulton (8 March 2009). "N.Korea vote may point to Kim successor". Reuters. Retrieved 2009-03-08. ^ "The Parliamentary System of the Democratic People's Republic of Korea" (PDF). Constitutional and Parliamentary Information. Association of Secretaries General of Parliaments (ASGP) of the Inter-Parliamentary Union. p. 5. Archived from the original (PDF) on 2012-03-03. Retrieved 2010-10-01. ^ a b "The Parliamentary System of the Democratic People's Republic of Korea" (PDF). Constitutional and Parliamentary Information. Association of Secretaries General of Parliaments (ASGP) of the Inter-Parliamentary Union. pp. 17–18. Retrieved 2010-10-01. ^ a b c "North Korea votes for new rubber-stamp parliament". Associated Press. 8 March 2009. ^ a b "Kim wins re-election with 99.9% of the vote". The New York Times. 9 March 2009. ^ a b Emily Rauhala (March 10, 2014). "Inside North Korea's sham election". TIME.com. Retrieved April 24, 2015. ^ "The Parliamentary System of the Democratic People's Republic of Korea" (PDF). Constitutional and Parliamentary Information. Association of Secretaries General of Parliaments (ASGP) of the Inter-Parliamentary Union. Retrieved 2010-10-01. ^ The Far East and Australasia 2003 (34th ed.). London: Europa Publications. 2002. p. 680. ISBN 978-1-85743-133-9. ^ "North Korea elections: What is decided and how?". BBC News. 19 July 2015. Retrieved 2015-11-26. ^ Kim Seong Hwan (June 10, 2015). "NK to hold local elections next month". DailyNK. Retrieved June 11, 2015. ^ York, Rob (June 9, 2015). "North Korea's local elections coming in July". NK News. Retrieved June 11, 2015. ^ a b Alma Milisic (19 July 2015). "Foregone result in North Korea's local elections". Al-Jazeera English. ^ "N Korea polls 'give no clue'". Press Association. 9 March 2009. ^ "N Korea's Kim wins parliamentary seat: official media". AFP. 9 March 2009. ^ "IPU PARLINE Database: Democratic People's Republic of Korea, Parliamentary Chamber: Choe Go In Min Hoe Ui, Elections Held in 2009". Inter-Parliamentary Union.